Home / News / Why Is Geography Important in a Globalizing World? The 21st century is the era of knowledge and creativity where education and innovation are the most important investments. Knowledge is the currency of the future. When drawn knowledge, the map of the 21st century can be utilized to discover and understand this new world. 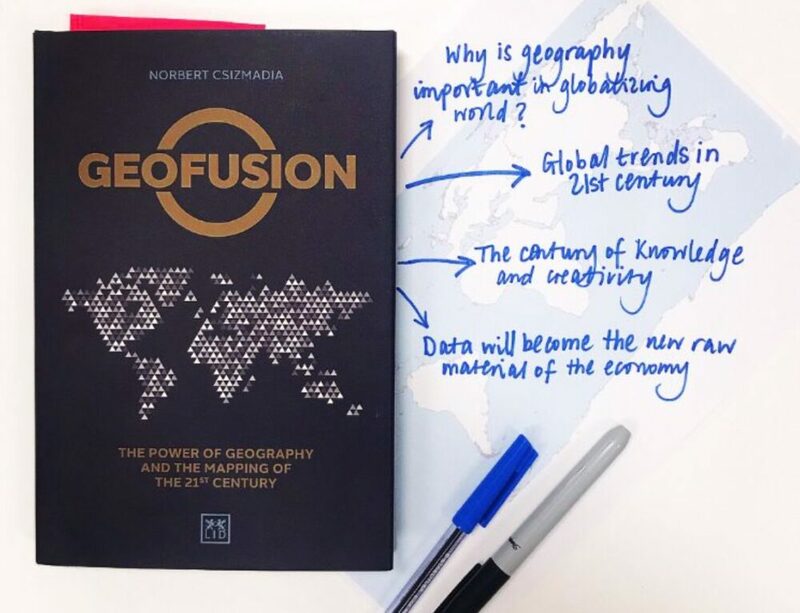 Geofusion: The Power of Geography and the Mapping of the 21st Century by Norbert Cszimadia helps to explain how ‘Geofusion’ provides the opportunities that can give lasting value to the world. “Globalization is not only a feature of our time but also a trend that has unfolded over a long historical horizon. The ancient Roman Empire can be regarded as an undeniably globalized arrangement, unifying a major part of the world as it was known at that time. Major milestones paving the way to globalization had included the great geographic breakthroughs, from the discovery of the Americas to Magellan’s first voyage around the world, and, much later, the expeditions to discover the unknown internal territories of various continents up until the 19th century. The unquestionable milestones of globalization were the colonial empires of the 19th century that spanned most of the world, among which the largest, the British Empire, covered 22% of the world’s territory and constituted 20% of its population. It was held together in a unified administrative and economic framework when it was at its peak in 1922. Although large empires have disintegrated, with the United States and Russia being the only exceptions, unification has picked up speed and spread at a pace that was previously unfathomable. Today, human society and the economy along with it have been radically transformed in the wake of globalization. The integration and the rise of networks within the global economy is unfolding at an accelerating pace from one decade to the next. The elimination of the barriers within the economy, the global unification of standards, and the global homogenization of consumption habits have given rise to a global economy that is increasingly becoming a unified whole and behaving like a single unit. The unification is also apparent in the global networks maintained by major financial institutions, spanning global hubs from Hong Kong to New York, and from London to Buenos Aires, allowing capital to flow freely between the different regions of the world. Therefore, it is no surprise that the role of geographic location has been radically transformed in this new economic and social structure. In fact, the significance of geographic location and physical distance seems to be disappearing completely. I the wake of falling transportation costs and the extended physical reach of technologies, distances are shortening and space is becoming ‘denser’. In the early 1990s, British economist Richard O’Brien published his book, Global Financial Integration. This provided an analysis of the global financial system, and instantly made O’Brien the central figure in the debate on the role of location within our globalized world. O’Brien argued that even at the time of writing his book, tens of billions of dollars were trading hands-on international money markets, and likewise, tens of billions of dollars could be transferred from one point of the world to another in a matter of mere seconds thanks to modern information technology. O’Brien predicted that “a state of economic development where geographical location no longer matters” was not far away. Today, we can ascertain beyond any doubt that O’Brien (who later became a futurist before trying his hand at a career in music) was wrong. Experience has shown that from 1996-2016 territorial location gained significance within professional, scientific, and economic policy discourse in the midst of global restructuring. Several of the most influential thinkers addressing the world’s global socioeconomic questions have dealt with the rising role of spatiality and places, specifically the growing significance of cities. An urban studies theorist, Richard Florida, presented a model where the role of places in general and cities, in particular, is deemed essential for the rise of the creative class, which is considered the driver of economic prosperity in his book, The Rise of the Creative Class. Edward L. Glaeser, professor of economics at Harvard University, wrote about the (economic) triumph of the city in one of his most important books. At the same time, we must also take into account that geopolitical guru Robert D. Kaplan identifies the recognition of the pivotal role of territoriality within global processes as the key tenet of his book, The Revenge of Geography, which can be seen as a response to O’Brien. Today, researching the geography of the world and of its smaller regions is gaining significance in various domains of social sciences. The new economic geography described by Paul Krugman, who was awarded the Nobel Prize for economics in 2008, set up a spatial equilibrium model of growth, and reincorporated geographic thinking into the mainstream of economic discourse. What is, in fact, happening within the global economic space? Globalization has slashed transportation costs, brought distant locations closer to each other, and seen the spatial networks of global production grow into a global web. In the knowledge-based economy, information may appear to disregard physical space and to be capable of being transmitted to any point of the world thanks to the steady rise in digital technologies. It is nevertheless apparent that strong territorial trends of concentration also prevail within the economy: the role of cities has become more important than ever, alongside the so-called ‘agglomeration effect’. However, while the majority of products markets have taken on global dimensions, what are known as input markets – primarily labour and technology – remain very much linked to location. Globalization not only unifies the world, but it also divides it. The networks of production space the entire world, while the central zones of the economy are typically engaged in very different types of activities compared with the less-developed peripheries. The key difference lies in the value added that they create. The high wage costs of advanced economies can only be guaranteed by continuous invention and innovation, i.e. the monopoly of new products, while mass production can be relocated to less-developed regions offering lower production and wage costs.